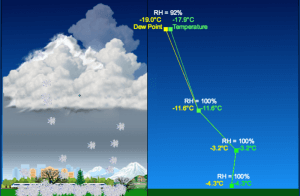 Explore the type of precipitation Set the air and dew point temperatures by dragging the anchor points and learn what type of precipitation will fall to the ground. Each time you release the mouse button, the simulation starts. You must use an up-to-date browser version to view this!